"Pony Express National Historic Trail"
California's first foreign-born Governor, John Downey was born in Ireland in 1827. Downey came to America when he was 15 years old. 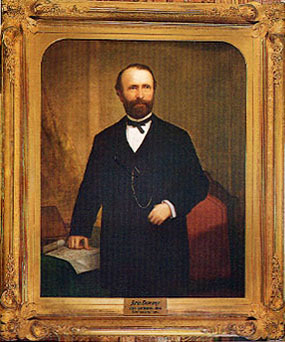 In 1846, Downey owned and operated a pharmacy in Cincinnati in partnership with John Darling. In 1849, lured by gold, Downey moved to Grass Valley where he mined for a brief time. By December 1850, Downey and James P. McFarland had opened a drug store in the Los Angeles area. His businesses did very well in Southern California, where the town of Downey is named after him. He served on the L.A. Common Council prior to his election to the State Assembly. After only five days as Lt. Governor, Downey succeeded Milton Latham who resigned the Governorship. Downey's veto of the "bulkhead" bill, which would have allowed ownership of San Francisco's waterfront by a monopoly, made Downey a hero. However, the issue remained volatile. On a visit to San Francisco, he called a man a "bulkheader" and fists began to fly. The fight was broken up when witnesses restrained Downey's opponent, crying, "you shan't strike the Governor!" Downey was described as being of medium stature and having a square build which made him appear rotund. Use the California State Library’s interactive tool to view Executive Orders and Proclamations signed by Governor Downey.